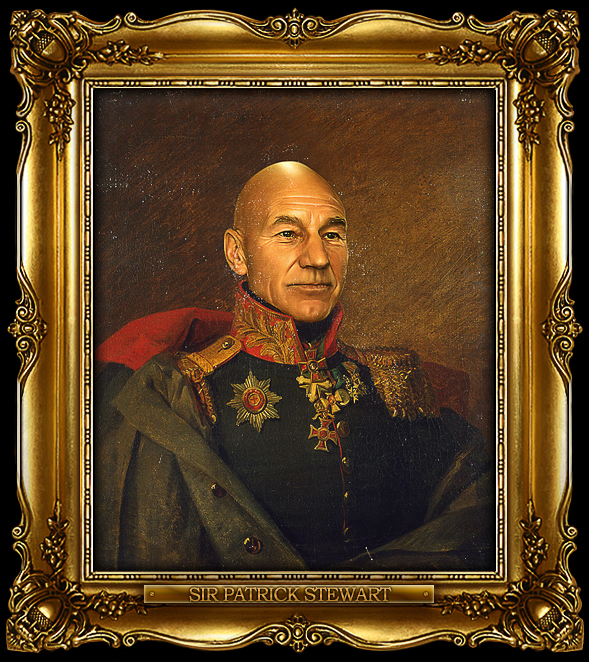 The problem with the Vislovatov (basis for almost everything about sub-unit distinctives until recently) was initially surfaced about 12 years ago by the authors of the 300-years History of the Russian Marines. The had found something “non-standard” for the Marines in 1811 – not according to Viskovatov. Upon further research, they found that Viskovatov was really quoting a proposal that was not formally adopted until early 1817. And the correct distinctives were as I have given them (very slight modifications from the 1809 order, to accomodate the new organization). Their work was publicized first in a symposium in Kaluga (maybe about 2002) and then publihed in Tseykhaus – and also appeared in Vol. 1 of the work on the Marines. As a sidenote, one of the authors was the very same guy who had, in the early years of Tseik, publsihed the Viskovatov version. Other reasearchers, for example Ilya Ulyanov, author of the 3-volume Russian Infantry series and his more recent Russian Infantry at War, have agreed. The painting instructions could use some corrections/editing. 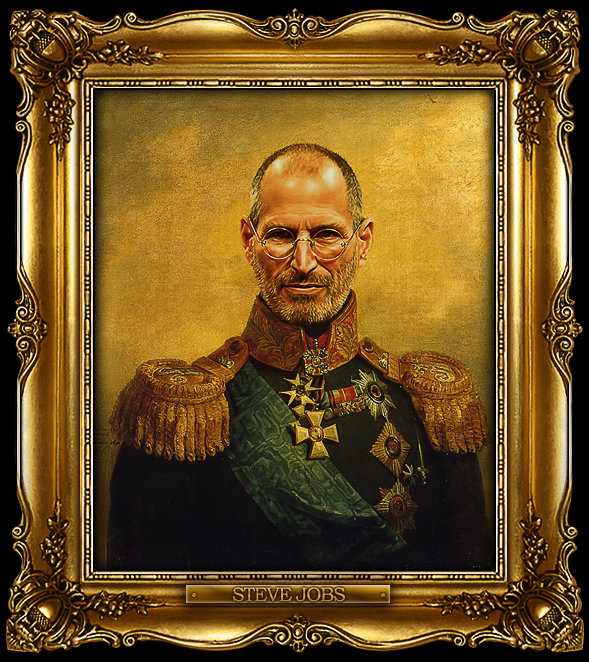 For examples …. center platoons : green with yellow center [correction]. However, the green with white center shown was correct per the prior regulation of 1809 and would again be correct from late 1816 or early 1817. It is possible that some units did not correctly follow the change to green with yellow center in 1811. Note : 1st and 3rd battalions typically served together as “the regiment”, with the 2nd battalion typically serving elsewhere in various “combined” formations. Note : The NCO’s pompom is shown as quartered orange and white, but the orange part was really a mix of black and orange and would likely appear darker than shown. – The division number should be in yellow [correction] for the green piped red shoulder straps. – The division number should be in yellow [correction] for the blue shoulder straps. Note : The numbers also should be vintage Russian cursive style, although you would have to be a great painter to really capture this – see link for a sample. Rankers in the center platoons of Jäger regiments were not equipped with infantry short swords. If musket-armed (as they were supposed to be), they had only the bayonet. So, you might want to slice off the short sword for them, if all the sprues have included it. [possible correction] If someone in the lower number Jäger regiments was using a left-over rifle, it would be shorter than the musket and would have a longer sword-bayonet. 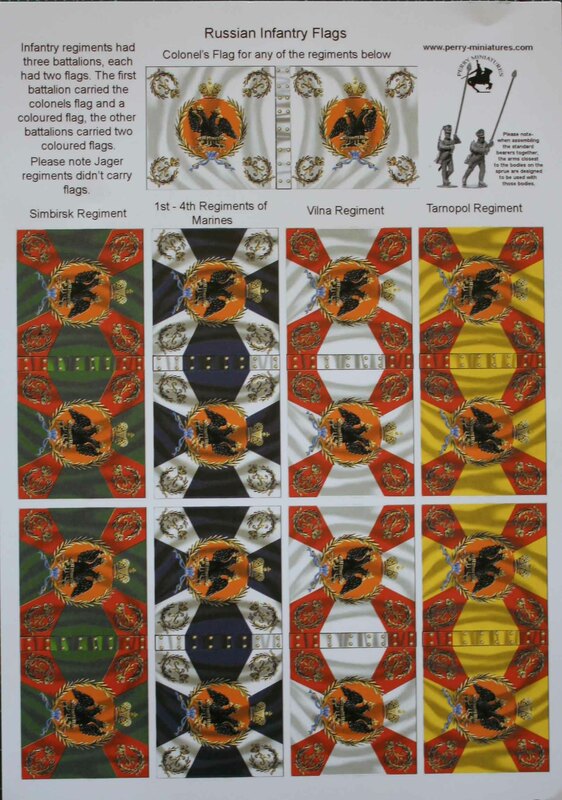 Some higher-number Jäger regiments were recently converted Infantry regiments. They could still have white belts, and even “incorrectly” could have kept their short swords for rankers in the center companies. Jäger Grenadier company cartridge boxes had the regiment number, like center companies (and there were no Carabinier companies or platoons …. there were Karabinier regiments, but only after 1815). This goes to the sculpts …. The rolled greatcoat lower end, where it is tied together, should correctly lie to the front of the leg, so that the right hand holding the weapon at “attention” is behind the greatcoat and its tie, close to the leg. However, images drawn from life show that putting the tie of the greatcoat at the side of the leg, behind the right hand at attention, was tolerated in some units (we assume more easy-going company sergeant-majors). It is actually easier to get the cartidges from the box if you wear the tied greatcoat correctly (I have tried it). This is more of a clarification than correction. Note that the were two bands of piping : one around the top edge of the band – “lower”, one around the crown – “upper”. In general, as forage caps were a fatigue/undress item, and were made locally from scaps and worn-out uniforms, greater than normal variation vs. the regulations was possible. 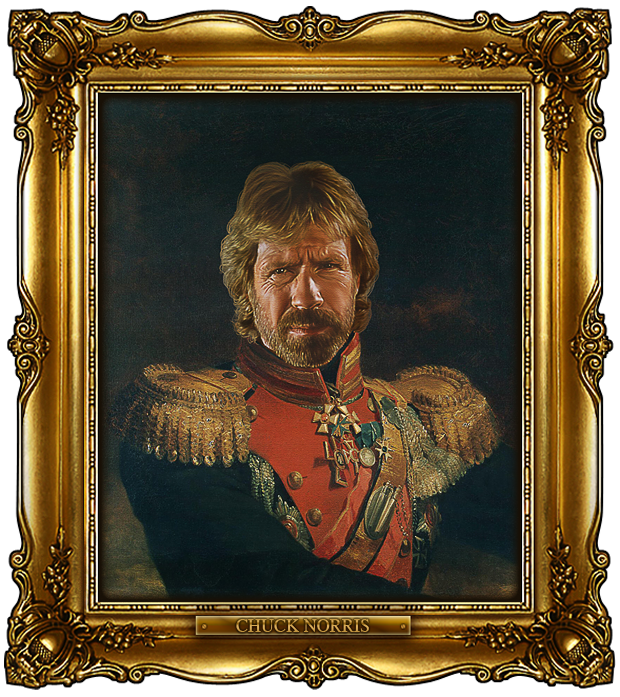 If you look at the painting instructions, the sword knot is shown as an upper-knot, a mid-section, a lower-knot, and the fringe. The fringe was white, as shown. That’s was easy. 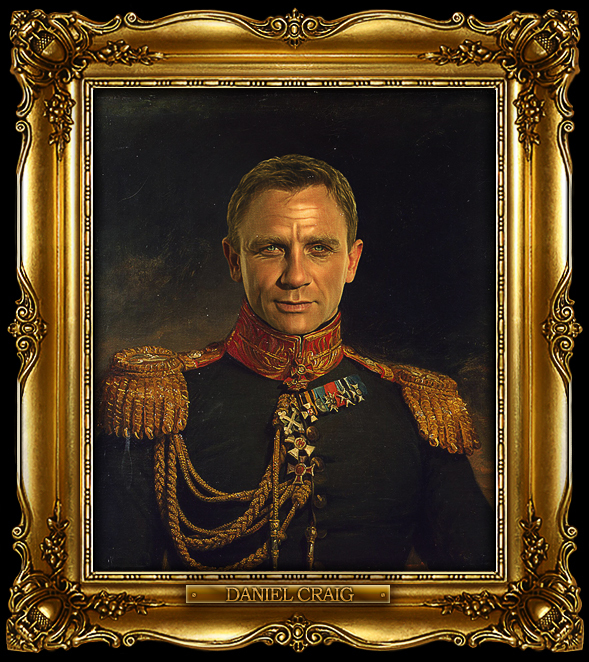 NCO swordknots, by regulation, should have had only the lower-knot in mixed orange and black. However, it appears that they had botht he lower-knot and upper-knot in the rank distinctive orange and black. The tassles (only) of the shako cords for NCO’s were a mix of white and orange and black. For other ranks, the pants or trousers for Grenadier, Infantry and Marine regiments were white wool in winter and white Flemish linen in summer. The black items called gaiters are actually sewn-on leather leggings for the winter pants. If you do them with paint, as suggested, it will take a couple of coats to get the correct effect. For fatigues, undress and often when on campaign, gray-ish or off-white loose pants (stuffed into the shank or top of the short boots used as footwear) were worn, sometimes called “bloomers”. The sculpts are actually a little tight for the regular pants (Russian pants had looser fit than French breeches), and you would need to add some milliput or similar to get the baggy look of the bloomers. For officers, the white pants were reserved for parades and mess-dress occasions. They wore gray “riding trousers” (wherher or not mounted) or dark green pants for most occasions. On campaign, company grade officers might also were the “bloomers”. For Jägers, the winter wool pants were dark-green. The tall thin plume was in use from 1811, even with the older (1809) shako. Only the Grenadier platoon had them – not the Marksmen platoon. The top-band around the top of the 1809 shako is sculpted very heavy. You might thin it a bit, or be careful in paining to not high-light it too much. The scupts are really early war, summer 1812 looking to me. 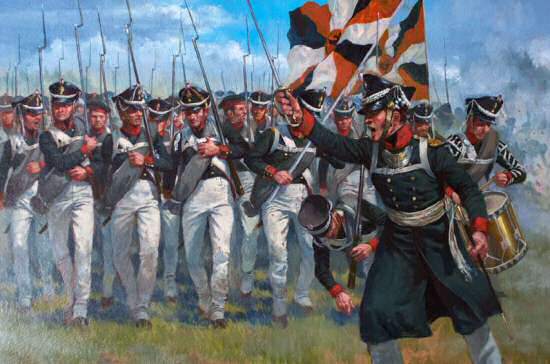 Especially after Borodino, and through the long march to Paris, it became rather common for Jäger rankers, without the infantry short sword, to just fix their bayonets and “lose” the shoulder-belt and frog for the bayonet. The French “furry” knapsacks were much prized (and with lots of dead French, it was easy to get one). French muskets and low shoes were not much prized. 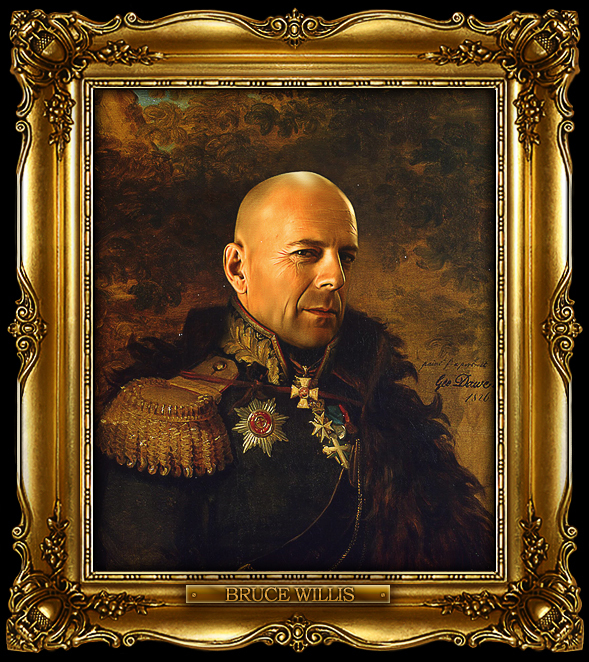 With their non-combatants, regiments could make-up boots locally if they found some leather. Similarly, they could make-up ammunition from raw materials or captures. The pre-war shakos were pretty much used-up by late 1812. Forage caps were pretty common unless a unit got re-supplied. The uniform coats had turned to rags by Spring 1813, but the greatcoats lasted quite well. Some captured cloth of some dark color could be made-up into new uniform coats. The men that made it to Paris barely looked like uniformed solders by the time they got there. Everyone was in bloomers. Scandals resulted, when they had to parade after the peace. Richer officers ran to the Parisian tailors. But I doubt that the parades mattered too much to the veteran rankers. Hope this information proves useful to some of you! 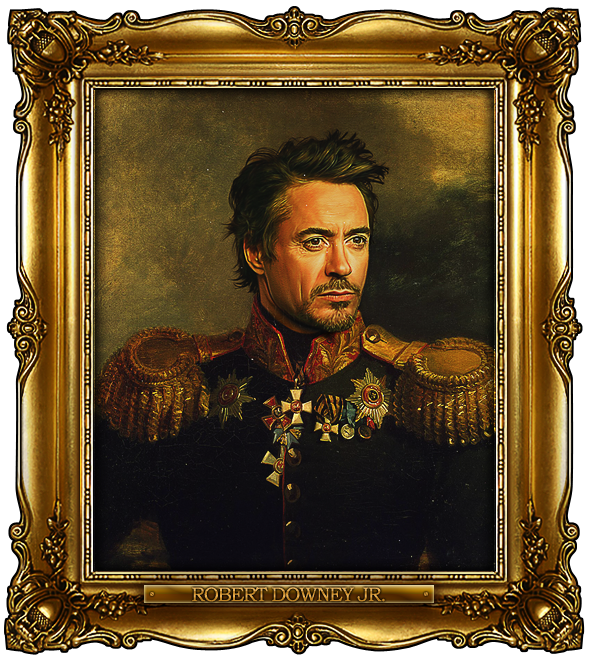 In case anyone wonders, the portraits shown in this post are from the Replace Face blog. 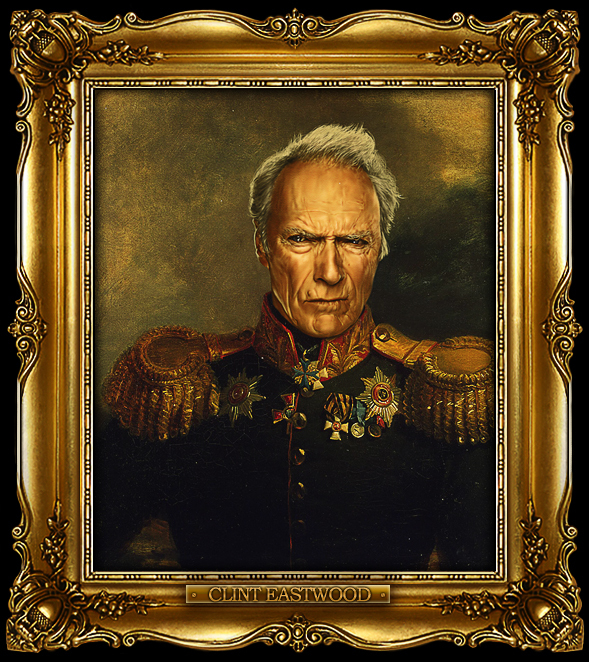 Steve Payne has taken paintings by the English portrait artist George Dawe who painted 329 portraits of Russian generals active during Napoleon’s invasion of Russia for the Military Gallery of the Winter Palace, Saint Petersburg, Russia. 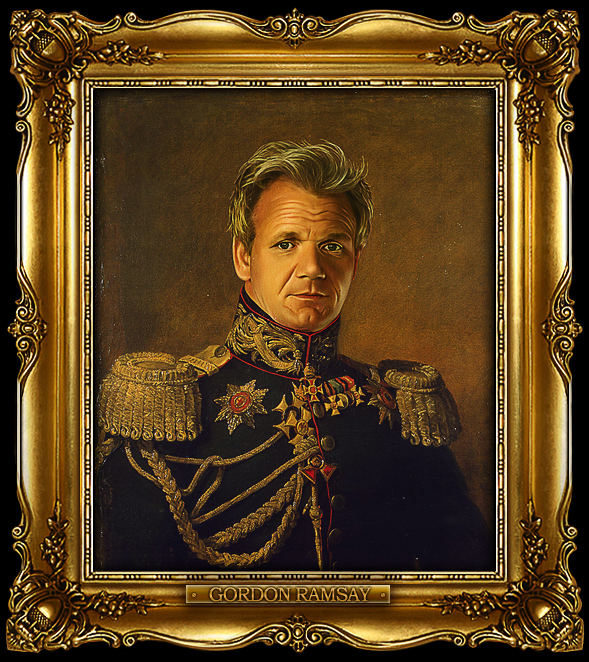 He is using digital copies of these paintings as a basis for his work which involves incorporating his friends, family and even some celebrities into the paintings using Photoshop. If you do not know it, go and check it out… I have only used some of my favourites here. Another week, another review. This time it is going to be Perry plastic Russians. I know these have been for sale since Salute or in other words a couple of month now, but mine only arrived last week and I have not seen any in-depth reviews of them since, so I wanted to give them a go after all. With the box set you get a total of 40 minis. There are 36 plastic soldiers spread out over six sprues, each containing six different minis. 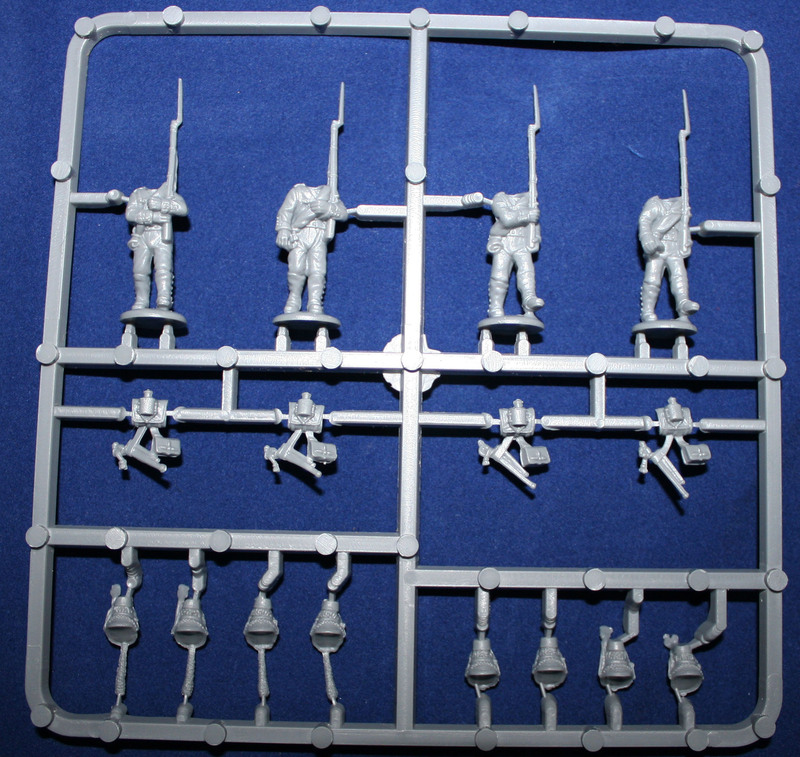 Also included is a four-mini command sprue. They all come with separate heads and backpacks. 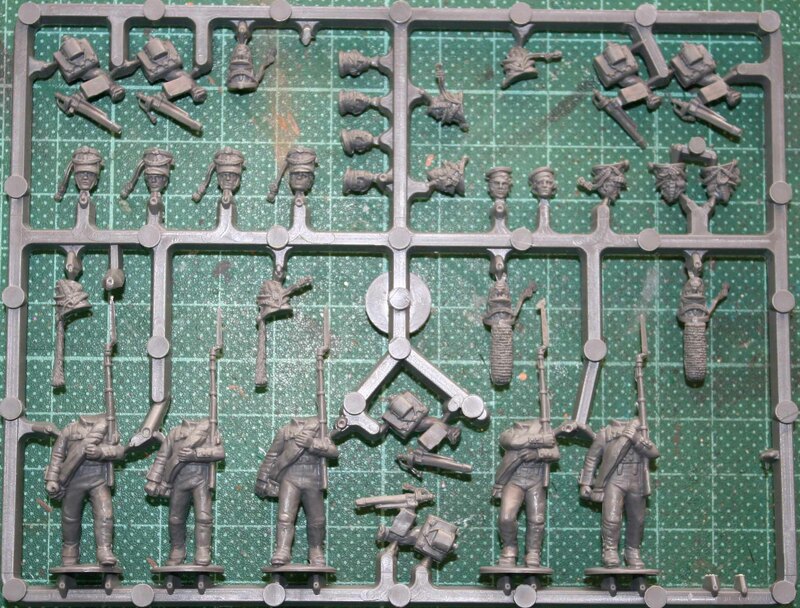 Each sprue comes with enough (four in case of the command sprue, six for the infantry) heads to equip all men with either 1809 Kiwer, 1812 Kiwer or fatigue cap. 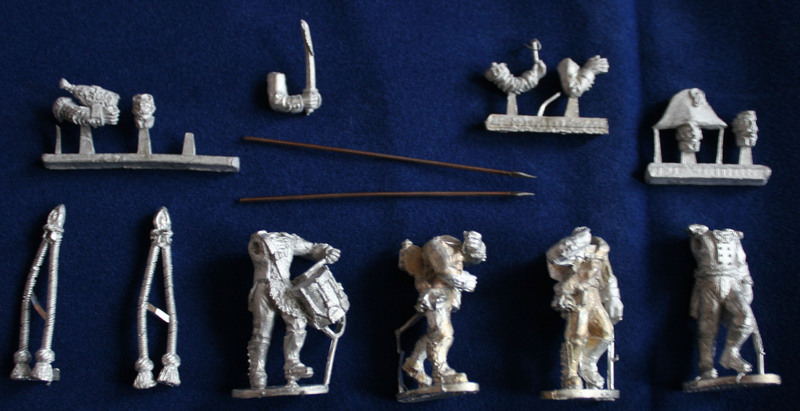 The infantry sprues also come with two grenadier Kiwers each of the 1809 and 1812 pattern. The backpacks are all cast with the swords and ammo pouch hanging down from them. The ammo pouches all come plain, without any plaques and such, so one is free to us them for both grenadiers and musketeers. Also included in the box are the usual bases and a two-sided A5 sheet with historic uniform information (sword knot, shoulderboard and pompom colours) and flags. The sheet contains five flags. The white Colonel´s flag and Regimental flags for the Simbirsk Regiment, Regiments of Marines (1st to 4th Regiments), the Vilna Regiment and the Tarnopol Regiment. Since the sheet is printed on heavy and glossy paper one would need to photocopy the flags for use. The flags are quiet nice, only the shadows are a bit strong for my taste. The quality is good enough that one does not need to use aftermarket flags. This box set retails for 18 GB£, which equals 0,45 GB£ per mini and also includes bases. (BTW this means that together with their British infantry this is the highest per mini price of their plastic sets.) By comparison the Warlord sets (a review of them can be found here by the way) cost 0,56 GB£ per mini or 0,62 GB£ in case of the Pavlov Grenadiers. So this puts them on the cheap end of plastic Russians on the market. And they are cheaper than metals as well. For example Front Rank are 1,15 GB£ per mini (or 1,08 GB£ if part of a Battalion pack) and Foundry are 1,50 GB£ per mini. The detail is good and as crisp as usual with the Perry plastics, but not quiet up to the level of metal minis. The undercuts are minimal. There were no mould misalignments, but the rest of the quality is a bit of a mixed bag. Half the sprues were fine with only minimal mould lines, but the other half had quiet heavy flash and also sinkholes on top the Kiwers. This is the first I have seen that in their plastics and I hope I only got a bad batch and not a sign, that the quality control on their plastics is not going the same way as on their metals. So now it comes to one of te most interesting part… how do they compare to other manufacturers? I had both Foundry and Warlord minis here. The style of sculpting is vastly similar with all manufacturers. This does not come as much of a surprise, since the Foundry Russians are Perry designed and Warlord and Perry are cooperating on their Napoleonic ranges. 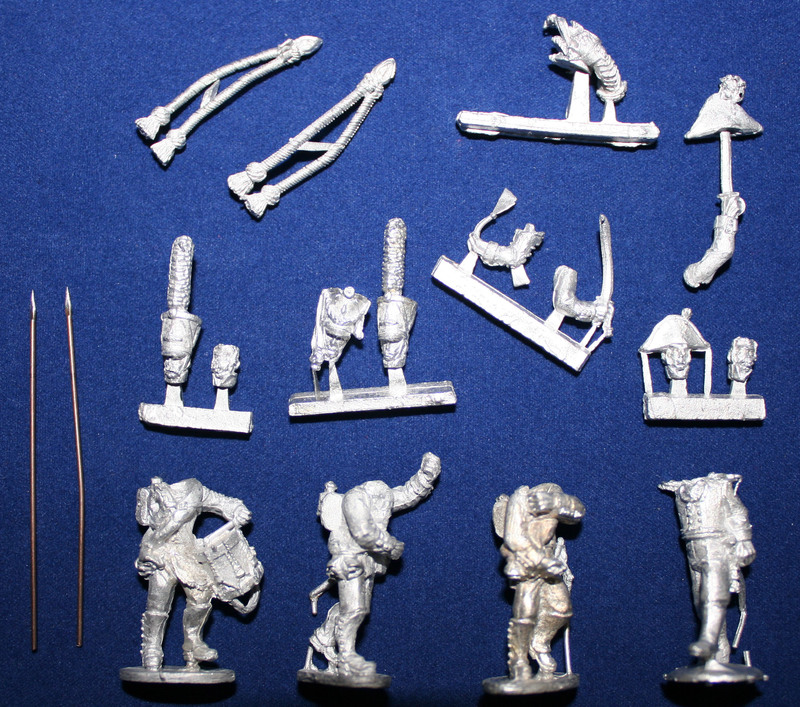 The Perry’s are about as tall as the Foundry minis and a little smaller than the Warlord´s. This is enhanced by the fact that the Perry´s (as well as Foundry) have thinner bases. The heft is comparable on the Perry, Foundry and Warlord metals. The Warlord plastics have a stronger heft and less detail though. One can see a real difference with the muskets. Both Warlord and Foundry are thicker then Perry. The Warlord muskets are the longest and the Foundry ones the shortest with Perry being in the middle. In the end one should be able to mix all manufacturers in one unit and even on one base (if you do not mind the muskets). One thing that did strike me was the interchangeability between the Perrys and Warlord, or rather the lack of it. I would have expected this to be high since they are cooperating on their Napoleonic releases. While one would not need to be able to mix and match backpacks, I thought that mixing their heads would give people more variety. But this is not going to be that easy. With the Perry minis the uniform collar is sculpted as part of the body, with Warlord it is sculpted as part of the head. So if you want to fit a Warlord head onto a Perry body you need to carve off one of the collars. If you want to do it the other way round you need to sculpt a collar. The Perry offering what one can ask for. They are the cheapest plastic Russians around, the detail and animation are good and the castings are generally crisp. If the flash and sinkholes on half my sprues are not a trend, this is all one can ask for and they are definitely recommended. With all the box sets you get a total of 32 minis. 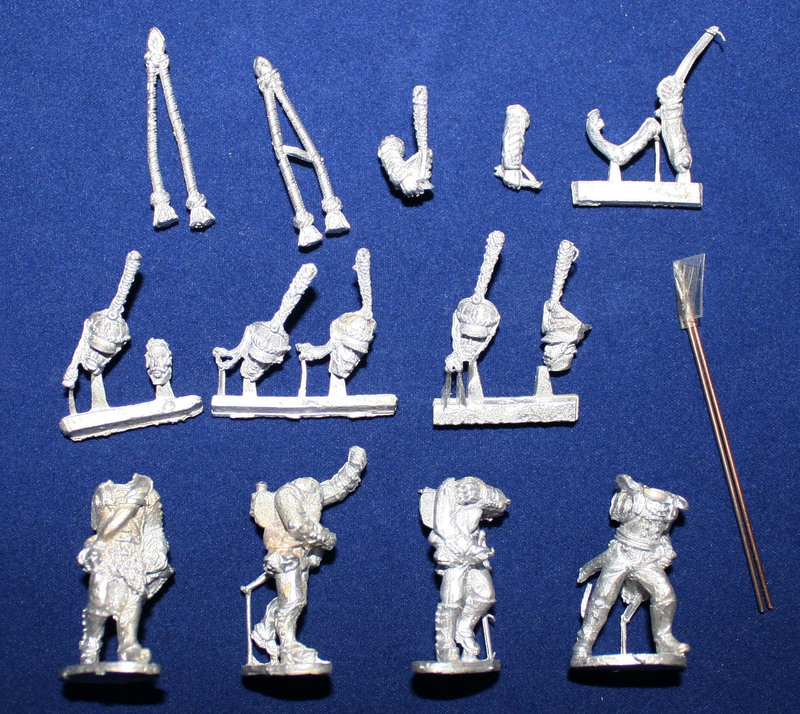 28 of them are plastic and four are a metal command (officer, two standard bearers and drummer), all in marching poses. Just as with their plastic Prussians the metal command also contains sharpened brass rods as staffs for the flag and metal finial with tassels. The brass rods seem to be thinner though and all off them were already bend to some degree when I opened the boxes. Regardless of the box set they all come with separate heads, the drummers and officers with a separate right arm. There is some variation within the metal contents. All three boxes had different drummers and officers (although with both the drummer and officer two of the poses are quite similar). One of the standard bearers was the same in all boxes, one was the same in both the line infantry boxes. With the officers there is a clear difference of uniform, so I assume, that this is due to the different boxes. With the others there is no difference in uniform, so I assume that this is a chance variation. The 28 plastic soldiers are spread out over seven sprues, each containing four different minis. They all come with separate heads and backpacks. 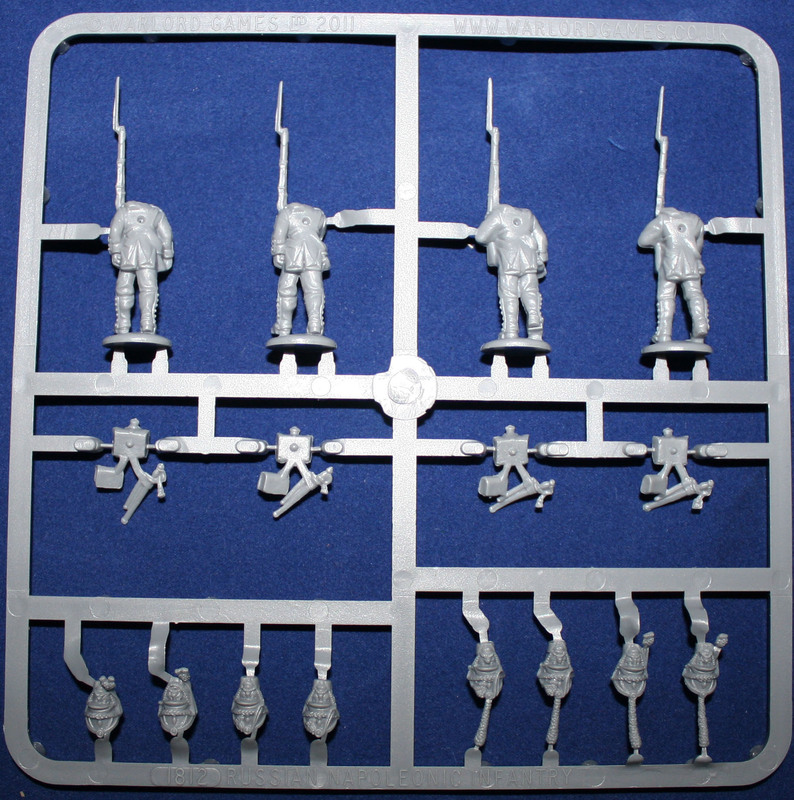 Each infantry sprue comes with both four heads with grenadier and musketeer shakos. In case of the 1812- 1815 infantry all shakos are uncovered, in case of the 1809 – 1812 box two of the musketeer shakos are covered. 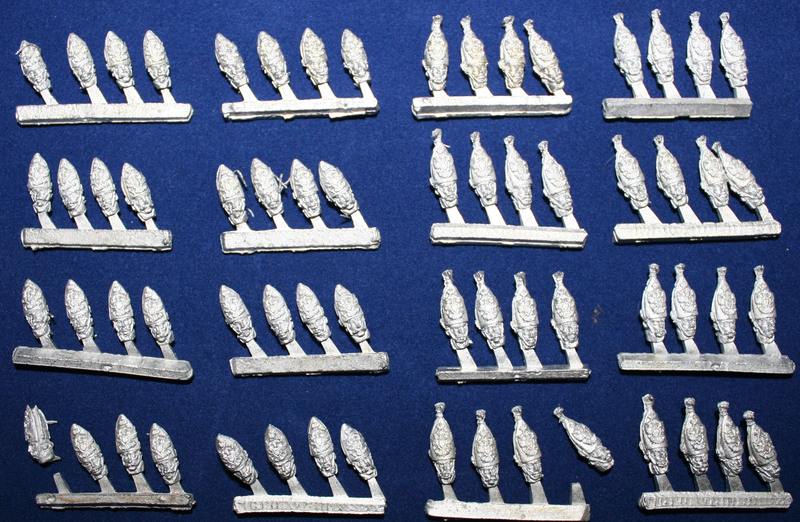 The sprues for the Pavlovsk Grenadiers are identical to the 1809 – 1812 sprues. In return there are 64 metal heads in Mitre (half are the grenadier variety, half the fusilier variety). The backpacks are all cast with the swords and ammo pouch hanging down from them. The ammo pouches all have grenadier markings (the leaflets included in the boxes state which parts you have to cut away to turn them into fusilier ones). Although only four different poses per box might seem few, I do not think that this is the case here. The poses are varied enough and with the separate heads, one should get enough variation out of the sets. So one really has to applaud the fact that they seem to have learned from the shortcomings of their Prussian Landwehr set. Also included in each box is a two-sided A5 sheet with a few photos of painted minis, basic historic information and flags. 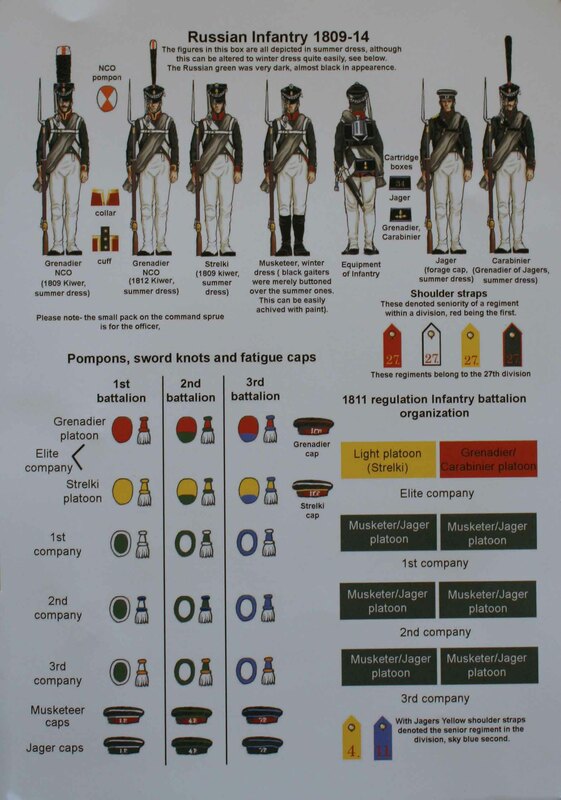 In case of the Pavlovsk Grenadiers these are their regimental and white colours. The 1809 – 1815 set contains eight flags, the 1812 – 1815 set ten (one of them is the white flag in both boxes). Since the sheet is printed on heavy and glossy paper one would need to photocopy the flags for use. The flags are OK. Unfortunately the contrast is even lower than with their Prussian set and the details on the flags designs are a bit undefined. All in all the sheet makes for a nice addition, but I would really advise the use of aftermarket flags. This puts them on the expensive end of plastics (although the 4 metal minis in there blur the equation somewhat). For example the Perry sell for between 0,45 GB£ (British Infantry) and 0,39 GB£ (Prussians) and those boxes include bases. Victrix sell for between 0,39 GB£ (Austrians) per mini and 0,36 GB£ (French Guard) . But they are still cheaper than metals. For example Front Rank are 1,10 GB£ per mini (or 1,03 GB£ if part of a Battalion pack) and Foundry are 1,50 GB£ per mini. So in the end they are more expensive than other plastics but still cheaper than metals. I am going to sub-divide this into the metal and the plastic minis. The metal minis are very crisp and clear in detail. Unfortunately mould lines are strong on some of the minis. There are no casting imperfections to be found, but a lot of the minis contained vast amount of flesh (I removed some of this before taking the pictures to give a clear view of them). Most of the officers and drummers have nice energetic poses. I especially like the option to have the drummers carry their shakos / Mitres under their arm. The standard bearers still come with closed hands, like the one in their Prussian set. It still irritates me, that Warlord state they want to keep the number of parts minimal for those who lack the assembly skill and still force them to drill the hands of the standard bearers open. They all are similar in size and heft, with one exception. The standard bearer I only got with the Pavlovsk Grenadiers seems much bulkier then the rest of the minis. Now on to the plastics. There is some scale creep between them and the metal contents of the box. The bodies are bulkier, but not enough to really stand out on the table. The heads on the plastics are larger and I think it will be noticeable on the bare heads. The detail is good although not as crisp as with the metals (or indeed Perry or Victrix plastics). The crossbelts and especially the buttons make a softer transition into the coat. 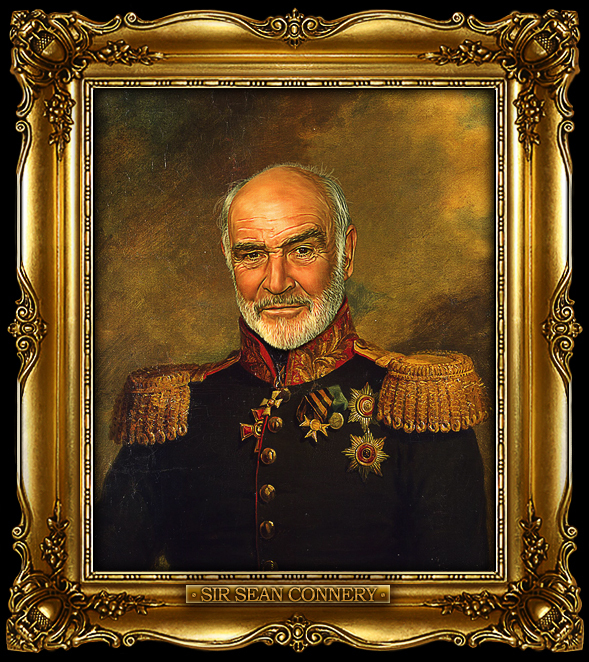 The hands still look large, although not as bad as on the Prussian set. The sides of the minis have good detail as well, but the definition deteriorates on some of them. This is still due to undercuts from the process of plastic castings. Again they have clearly learned from their Prussian set since they have now made the heads and backpacks separate, but it is still not as good as on Perry or Victrix minis. Size wise these minis should work well with the Napoleonic minis produced by the other mayor companies. Obviously the real test comes if you want to mix them in one unit or even on one base. When compared to Foundry they are a little taller, which will be enhanced by the fact that their bases are thicker as well. The heft is stronger on plastic and similar on the metal minis. The heads on the Foundry minis are slightly smaller when compared to the plastics. The style of sculpting is vastly similar. So one should be able to base them together without either standing out if you slip a card under the Foundry minis. 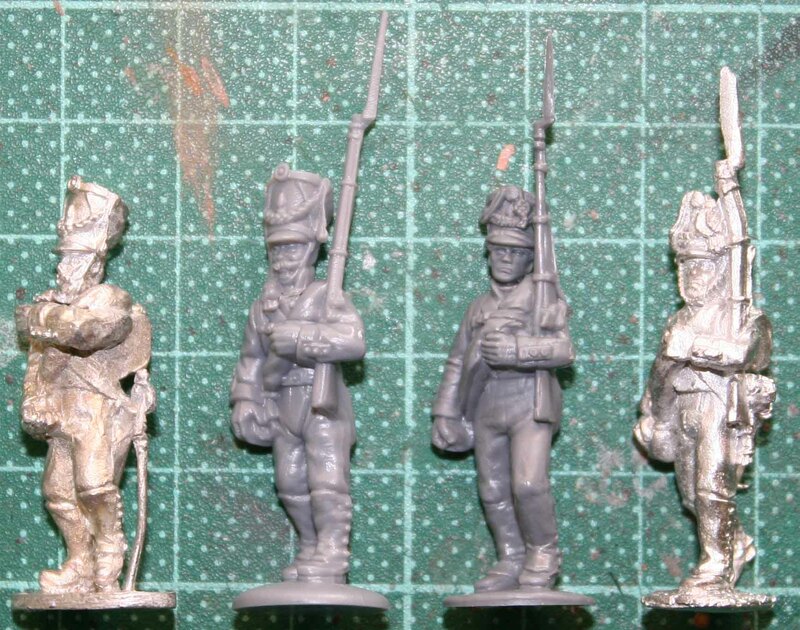 All in all one can see improvement in the Warlords plastic Napoleonics. The variety has grown better and so has the detail on the minis due to the fact that they made them multipart. On the other hand the general detail is still not as good as it is on both Perry and Victrix plastics and the same goes for the undercuts. Given the fact that they are still the most expensive plastics out there, one could hope for better. Given the fact that Warlord and Perry have a strong cooperation on their Napoleonics sets, one can hope that these will mix nicely with the Perry Russians when they come out. But given the fact that the Perry´s will most likely be cheaper, have better detail and more variety in their boxes, Warlord will still be the junior partner in that relationship.